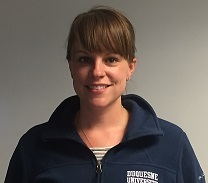 Lindsay is studying full-time under the direction of Ben Kivlan, PT, PhD, SCS, OCS with an emphasis on closed chain kinematics in patients with ankle sprain. Prior to initiating her PhD, Lindsay was employed as a physical therapist at Uniontown Hospital. She also gained clinical experience working for Triage Staffing and Anne Arundel Medical Center in Annapolis, MD. Lindsay is certified as an orthopedic specialist (OCS) by the ABPTS and an Orthopedic Manual Physical Therapist (OMPT). Lindsay works as a graduate assistant in the Motion Analysis Laboratory in Rangos. Daniel is studying under the direction of Jason Scibek, PhD, ATC with a focus on shoulder pathologies. Daniel comes to us from Lander University in South Carolina where he was an Assistant Professor and served as Director of the Athletic Training Program. Daniel obtained a Bachelor of Science in Sports Medicine from Erskine College in 2000. Subsequently, he graduated from East Tennessee State University with a Master of Arts in Physical Education with concentration in Sports Sciences. His thesis was entitled: 'A comparison of strength and resistance curves for the internal and external rotators of the shoulder'. Ryan is studying full time under the direction of RobRoy Martin, PhD, PT, CSCS with a focus on non-arthritic hip pathologies. Ryan came to Duquesne from the University of Georgia where he was a staff Athletic Trainer and an Adjunct Faculty member in the Department of Kinesiology. Ryan received his Bachelor of Science in Athletic Training from James Madison University in 2008. He served as the Head Athletic Trainer at Bishop McDevitt High School in Harrisburg, PA before attending the University of Georgia where he received his Master's in Exercise Science. Ryan works as a graduate assistant at West Penn Hospital on a research affiliation at the office of John J. Christoforetti, M.D.